Once December finally rolls around, we love to proudly hang a Christmas wreath on our front door for all to see. One of the most popular decorations of the holiday season, their round shape is said to represent eternity and the concept of life never ending. While traditionally the Christmas wreath was made using sprigs of holly along with berries and other bright fruits for added colour, they’re crafted with lots of different materials today. To help get you in the mood for this year's festivities, we've picked out our favourite Christmas wreath designs from our online store. With fabulous knitting and crochet patterns available to download or have posted to your home right now, we're sure we'll be able to satisfy your urge to get crafty. You’ll be surprised how easy it is to turn our Robin Christmas Wreath Knitting Pattern into a make you’re really proud of. The ring features cable stitch, while the leaves dotted with juicy red berries are worked in garter stitch. A pair of chubby robbins add the final finishing touch. Alternatively, if you’re a fan of cool Scandinavian styling, we know a pattern that’s sure to appeal. 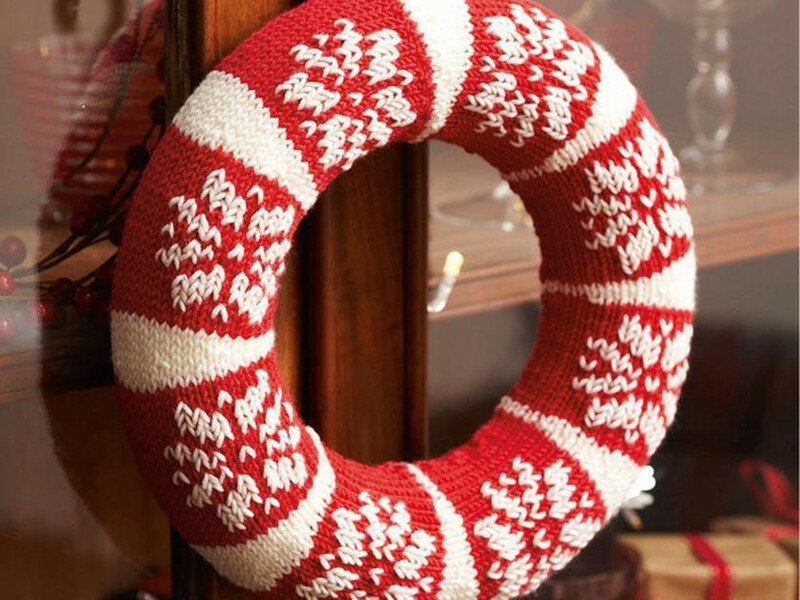 Our Scandinavian Style Christmas Decoration Knitting Patterns bundle features a red and white Nordic wreath. Or if you’d like to break from tradition by making something you’ll be able to keep on display after the festive period, our Heart And Flower Wreath Crochet Pattern is a lovely option. The decoration is constructed by joining roses together. While we’ve chosen to crochet ours in classic shades of red and pink, you can be really creative with this project by choosing yarns that’ll complement your home interiors. And not only will it prove that home really is where the heart his, it’ll bring a chic country cottage style vibe to your surroundings.